Warning: count(): Parameter must be an array or an object that implements Countable in /mnt/web312/b0/42/52594242/htdocs/website_b/administrator/components/com_poweradmin/models/menuitem.php on line 376 Warning: count(): Parameter must be an array or an object that implements Countable in /mnt/web312/b0/42/52594242/htdocs/website_b/administrator/components/com_poweradmin/models/menuitem.php on line 376 Warning: count(): Parameter must be an array or an object that implements Countable in /mnt/web312/b0/42/52594242/htdocs/website_b/administrator/components/com_poweradmin/models/menuitem.php on line 376 Warning: count(): Parameter must be an array or an object that implements Countable in /mnt/web312/b0/42/52594242/htdocs/website_b/administrator/components/com_poweradmin/models/menuitem.php on line 376 Warning: count(): Parameter must be an array or an object that implements Countable in /mnt/web312/b0/42/52594242/htdocs/website_b/administrator/components/com_poweradmin/models/menuitem.php on line 376 Warning: count(): Parameter must be an array or an object that implements Countable in /mnt/web312/b0/42/52594242/htdocs/website_b/plugins/system/jsnpoweradmin/jsnpoweradmin.php on line 195 Warning: count(): Parameter must be an array or an object that implements Countable in /mnt/web312/b0/42/52594242/htdocs/website_b/administrator/components/com_poweradmin/models/menuitem.php on line 376 Warning: count(): Parameter must be an array or an object that implements Countable in /mnt/web312/b0/42/52594242/htdocs/website_b/administrator/components/com_poweradmin/models/menuitem.php on line 376 Warning: count(): Parameter must be an array or an object that implements Countable in /mnt/web312/b0/42/52594242/htdocs/website_b/administrator/components/com_poweradmin/models/menuitem.php on line 376 Warning: count(): Parameter must be an array or an object that implements Countable in /mnt/web312/b0/42/52594242/htdocs/website_b/plugins/system/jsnpoweradmin/jsnpoweradmin.php on line 227 Warning: count(): Parameter must be an array or an object that implements Countable in /mnt/web312/b0/42/52594242/htdocs/website_b/libraries/joomla/application/application.php on line 481 Krippen : Krippen &#38; Hüte weltweit! HomeProgrammKulturgeschichte Krippen Krippen & Hüte weltweit! Pfarrer Franz Pitzal zeigt seit fast 40 Jahren Krippenausstellungen in der Martinuskirche in Renningen, Landkreis Böblingen. Seine herausragende Sammlung ist nun einer Sonderausstellung im Deutschen Hutmuseum Lindenberg (02.12.2017 bis 02.02.2018; weitere Informationen: www.deutsches-hutmuseum.de) zu sehen. Internationale Krippen aus vier Kontinenten und die dazu passenden Kopfbedeckungen behüten und beschützen das Christkind und die Heilige Familie. Diese ungewöhnliche Krippenschau verbindet Hüte und Krippen aus aller Welt. 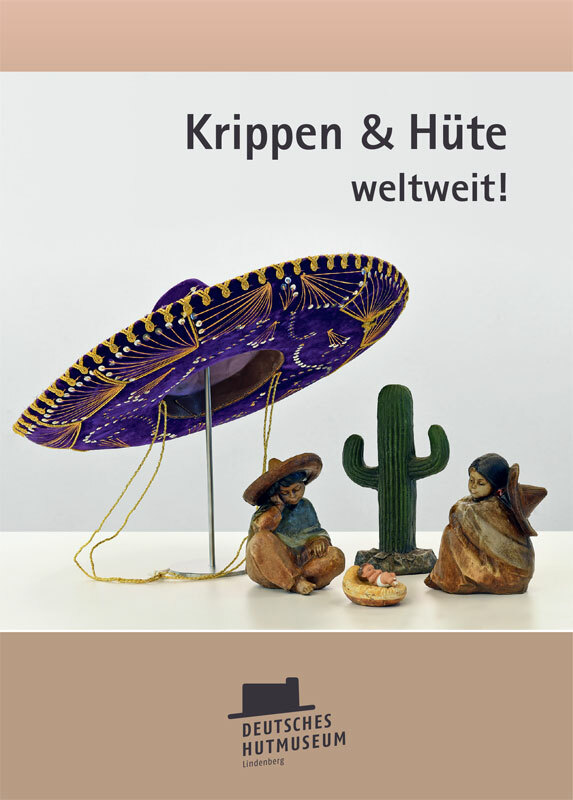 Unser Begleitheft zur Ausstellung zeigt detailreich die vielen Exponate dieser besonderen Krippenausstellung.